By Angela LaScala-Gruenewald / April 7, 2014, 7:30 a.m. Many who watched the New York City mayoral elections last fall could have predicted this fight. As early as September of last year, Bill de Blasio announced his intent to roll back public support for New York City charter schools, particularly when it came to charter schools that shared space with public schools (known as “co-locations”). Now, as he enters his fourth month as mayor of New York City, de Blasio has begun his “war on charter schools,” a phrase used by Eric Cantor, the New York Post, and many others. As de Blasio’s administration began to act on campaign promises during his first few months in office, this charter schools “war” received the most attention. While many of de Blasio’s statements have alienated Republicans and centrist Democrats, and sent his approval ratings sliding fast among constituents, his current standing points more to a failure to communicate combined with a lack of concrete plans to go along with his abstract goals and philosophical ideals. The “war” therefore provides a small piece of insight into the larger issues that de Blasio will face during his term. Beginning in late February, Mayor de Blasio began to ruffle feathers as he threatened to close charter schools that were considered inefficient and encroaching on public schools. He was met by rallies from charter school supporters, attacks from the director of the Success Academy network, Eva S. Moskowitz, and even pushback from New York Governor Andrew Cuomo. Supporters of charter schools feared de Blasio would damage a system that serves students (arguably a select group of students); critics of charter schools looked on warily, concerned that the new mayor would be a poor implementer of reform and unable to save the crumbling traditional public school system. So far the damage (if we can call it that) appears minimal. Entering office, he inherited forty-five co-location plans approved by former Mayor Bloomberg. De Blasio reassessed each school and approved fourteen of the seventeen charter schools that applied for co-location. Five of the approved schools were run by Moskowitz’s Success Academy network. The three that were not approved for co-location were also run by Success Academy network. Two were elementary schools set up on high school campuses (generally a discouraged practice), and the third would have taken up space available for special-needs programs in a crowded Harlem school. De Blasio’s moves in the past weeks hardly seem as divisive as his critics would claim or even his own messages would suggest. While this is a small example in a long, four-year term, it reveals a disconnect between de Blasio’s messaging and his actions. Through his speeches and interactions with the public and other officials, the mayor often reinforces a general sentiment that, as Juan Williams put it, he is “crippling the growth of charter schools by throwing them out of rent-free space” and “trashing” this valuable source of education. From a different standpoint, however, de Blasio’s stance may very well include an important critique of charter schools. Their overwhelming presence in cities like New York has taken resources away from the traditional public school system. His head-to-head with charter school advocates has brought up important questions and refueled a critical debate in the education world. How can New York City and similar urban environments harness the power of innovative charter schools while maintaining and strengthening the general public system? How can the government reward successful charter schools and weed out weaker ones? However, in going about investigating these questions, the mayor has made several missteps which make it difficult for his message to find traction within either the conservative or progressive community. To gain this traction, he needs to reframe the debate and step back from the controversial issue to focus on conducting research on how funds are diverted within each system and how measurements can be made to evaluate the success of public schools and charter schools alike. He must find a way to avoid alienating the charter school crowd, yet still push forward an agenda that provides every New York City student with better access to a quality education. Public relations mishaps, especially within a subject as touchy as the charter school debate, could deeply impact what progressives hoped to be a new movement in a major American city. A second concern relates to how de Blasio plans to connect his campaign platforms for school reform to policy implementation on the ground. When it became clear that de Blasio was the frontrunner in the New York City mayor race, his education plan received a great deal of attention. In a nine-page report, he included a list of improvements for New York City’s education system. From universal pre-K to college and career preparation, his recommendations were as numerous as they were vague; perhaps we could look at them as a laundry list of liberal hopes for education reform. On an ideological level, some of his plans have driven fear into the hearts of many conservatives because of his support for progressive education and traditional public school systems. On a managerial level, he has worried his supporters because of his lack of concrete plans. The report released during his campaign provides an overview of major objectives for reform, but no clear initiatives. The checklist de Blasio used to evaluate the seventeen co-locations appeared to focus on resources, but did not mention metrics for evaluating charter school success (e.g. quality of education) vis-à-vis the detriments such schools cause to the co-location public schools. While all eyes are on de Blasio as a representative of what a progressive agenda can or cannot do in a complex urban environment, he is finding it difficult to come up with plans to support his larger philosophical concerns. 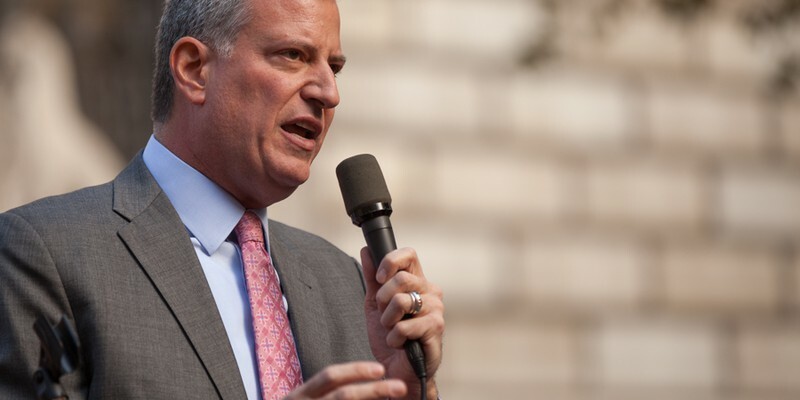 Ultimately, what Mayor de Blasio faces at the beginning of his term is a PR problem. The depths of these challenges, however, stretch beyond the issue of just making friends and to the more important challenge of developing pragmatic policy implementation plans and strategy—what one could call the content behind the campaign agenda. If de Blasio can develop this content, and then communicate it skillfully, he may reassure his supporters while still pushing forward his progressive reforms. The image featured of Bill de Blasio is from Kevin Case's Flickr. No alterations have been made.